We spend a lot of our time, money and energy during this time of year to file our taxes accurately. However, where does that money go? The National Priorities Project conducted a study of the 2015 budget and found that our Government received $3.8 trillion in revenue. 55% came from tax revenue, 30% from Trust Funds (Social Security & Medicare Taxes, Customs, etc.) and 15% from borrowing. 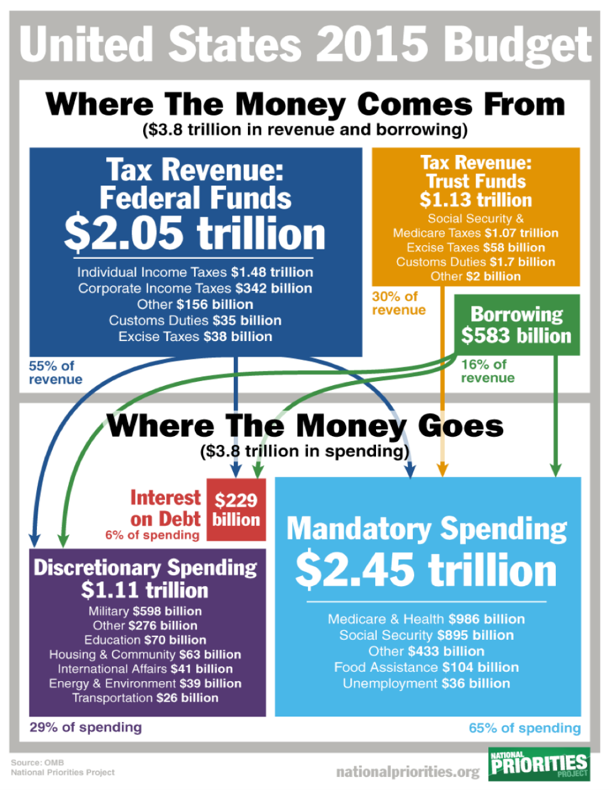 The Government then took that money and spent 65% on mandatory spending (Medicare, Social Security, & other social services) and 29% on discretionary spending (Military, Education, Transportation, etc.). The remaining 6% was used to pay down the interest on the National Debt. The top three expenditure areas for our Government in 2015 was Medicare and Health: $986 Billion, Social Security: $895 Billion, and Military: $598 Billion. See the chart below for more interesting detail.